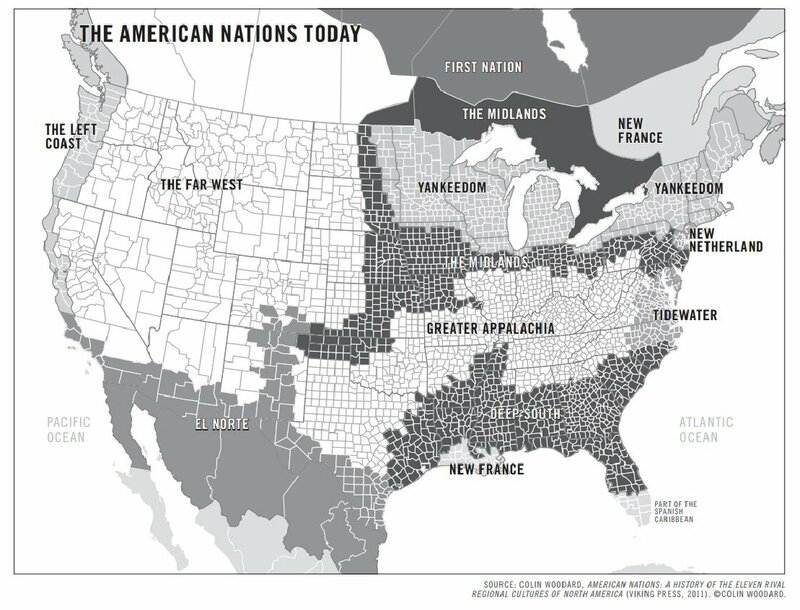 There are a couple maps like this floating around where the US is divided up into geographic regions based on culture, economics, or other kinds of geography. This is one of the more interesting, from the New York Times-slash-Joel Kotkin. We don’t have to create these regions; they already exist, on two levels. First, there are now seven distinct super-regions, defined by common economics and demographics, like the Pacific Coast and the Great Lakes. Within these, in addition to America’s main metro hubs, we find new urban archipelagos, including the Arizona Sun Corridor, from Phoenix to Tucson; the Front Range, from Salt Lake City to Denver to Albuquerque; the Cascadia belt, from Vancouver to Seattle; and the Piedmont Atlantic cluster, from Atlanta to Charlotte, N.C.
Federal policy should refocus on helping these nascent archipelagos prosper, and helping others emerge, in places like Minneapolis and Memphis, collectively forming a lattice of productive metro-regions efficiently connected through better highways, railways and fiber-optic cables: a United City-States of America. Check out the whole thing. It’s always interesting to see what maps like this do with Minnesota and the Twin Cities. Because we are so geographically isolated, we don’t always fit neatly into regional categories like the “Great Lakes” or one of the coastal agglomerations. The emphasis of the map seems more on the regional agglomerations of cities than of their backdrop “regions”. It’s similar to the “emerging megaregions” map: http://www.america2050.org/images/2050_Map_Megaregions2008_150.png but that does away with the background colors. In these analysis, MSP is kind of viewed as an offshoot of Chicago’s region. That’s probably the case, given its historic connections to the Mississippi system and the Great Lakes. Still, as you say, Minneapolis is more isolated, and fits uncomfortably in these frameworks. Kansas City and Salt Lake City have similar issues.